It’s official. Facebook is no longer number one with teens. A new study from the Pew Research Center found that just 51 percent of Americans from 13 to 17-years-old say they use Facebook. That’s down from 71 percent in 2015. Those same teens now use Instagram (72 percent) and Snapchat (69 percent) to connect online. And 45 percent of teens report being online almost constantly. YouTube was actually the most ubiquitous online platform for teens, with 85 percent of American kids saying they use the video sharing site. But Instagram and Snapchat, more traditionally understood as “social media” services like Facebook, are the biggest winners. Just three years ago, Pew found that 52 percent of teens used Instagram and 41 percent used Snapchat. Only 32 percent of American teens report having a Twitter account. The number of teens who report being online “almost constantly” jumped significantly since Pew’s 2015 poll. Forty-five percent of teens say they’re online almost constantly (both on smartphones and computers) compared with just 24 percent who said the same thing in 2015. Forty-four percent reported being online “several times a day” in the most recent study. Back in 2015, “several times a day” was the most popular answer, reported by 56 percent of teens. When you drill down into which social media platforms teens use the most frequently, Facebook is again a huge loser. Snapchat is the winner overall, with 35 percent of American teens saying that use it the most, with YouTube a close second at 32 percent. Just 10 percent of American teens report that Facebook is the social media platform they use most often. One of the most interesting findings by the new Pew study is that Facebook is now the most popular with kids from lower income homes. Teens who come from a household that makes less than $30,000 per year are the most likely to use Facebook, with 70 percent reporting that they use the platform. For teens who lived in a household that makes $30,000 to $75,000 it was just 56 percent. And for teens living in a household that makes over $75,000, only 36 percent report using Facebook. When it comes to platforms like Instagram, household wealth didn’t matter nearly as much. Roughly 74 percent of teens from households that makes less than $30,000 per year have an Instagram account. About 71 percent of teens from wealthy families ($75,000+) also had an Instagram account. Instagram is owned by Facebook. While there are some dramatic differences between the platforms that teens from wealthy families and poorer families use, smartphone ownership has become incredibly common across the board. Ninety-five percent of American teenagers have a smartphone, with only slight differences based on family income. For families that make less than $30,000 per year, 93 percent of teens have a smartphone, identical to the percentage from teens who come from families that make $30,000 to $75,000. But for teens in families that make over $75,000 that number jumps to 97 percent. How do teens feel about social media in general? Roughly 45 percent were agnostic about its impact, saying that it was neither positive nor negative. About 31 percent said that social media was generally positive, and 24 percent said it was mostly negative. Of the teens who said it was mostly negative, 27 percent cited bullying and rumor spreading. 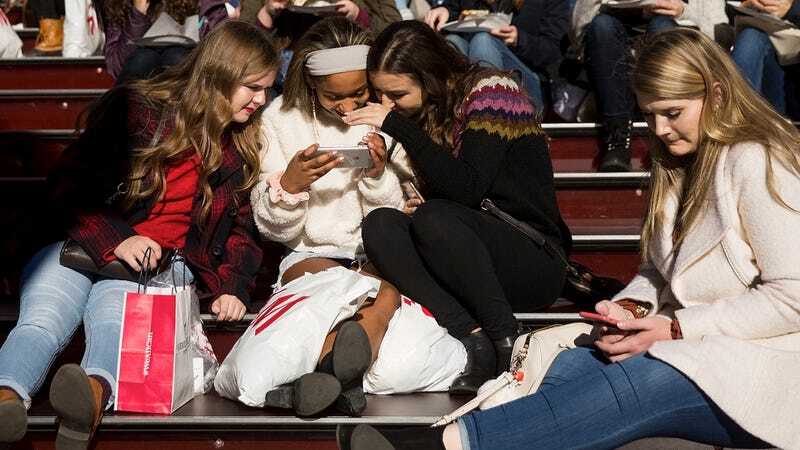 But of the teens who said that social media was mostly positive, 40 percent said that it was a great way to connect with friends and family. It’s hard for a lot of people to imagine today’s dominant social media platforms disappearing. But those of us who used to have a MySpace account (or a Flickr account for that matter) know that it doesn’t take long for things to go south. Facebook is still the most dominant social media platform in the world, but that could change very quickly, especially if younger generations don’t want to use it. And if this latest poll is any indication, teens don’t think Facebook is worth their time anymore.